Translation to English. Original in Russian below. Перевод с русского. Оригинал ниже. 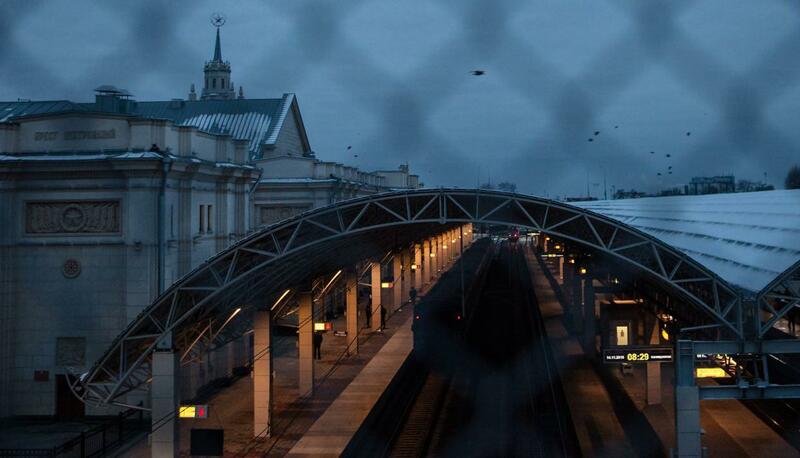 Every day, hundreds of Chechens take a train from Brest, Belarus, and go across the border into Terespol, Poland. Polish authorities do not allow more than two families to pass through a day, but the Chechens try again and again. Many of them have to live at the station. Chechen President Ramzan Kadyrov has said that the people in Brest are not refugees but “hostages of the secret services of European countries that seduce Chechens with tales of paradise.” Meduza's special correspondent Ilya Azar went to Brest, to see what is happening there and record the stories of several of these refugees trying escape oppression and torture in Chechnya by fleeing to Europe. The railway station in Brest is monstrous Stalinist building. It is a bridge between Russia and Belarus and Europe. Twenty minutes by train and you are in the Polish Terespol. You do not need to have a Schengen visa to embark. The number of refugees trying to get to the West via this route increased sharply in the summer of 2015. Brest border guards reported that, back in January 2015, the first inhabitants of the Russian Caucasus and Central Asia to have attempted this journey numbered 700. In July 2015, there are about 2,000 and in August 2015 more 8,000. "Everything was simple then. One hundred Chechens would come at once, 70 of them one day and the remaining 30 the next," said Vyacheslav Panasyuk, coordinator of a legal assistance program for refugees in Brest created by human rights organization Human Constanta. All that changed when the conservative Law and Justice Party came to power in Poland and an influx of Syrian refugees began in Europe. "Rallies swept across rallies under the slogan 'Poland is not a Muslim country'," said Panasyuk. The Human Constanta mission launched in Brest in September 2016, when Chechen refugees drew attention of both Russian and international media. This occurred after a rally in which the Chechens demanded Polish border guards to, at the very least, accept their applications for refugee status (as required by the relevant Geneva Convention), as more often than not they were simply being sent back to Belarus. According to Panasyuk, today, Brest has at least several thousands of Chechen refugees. 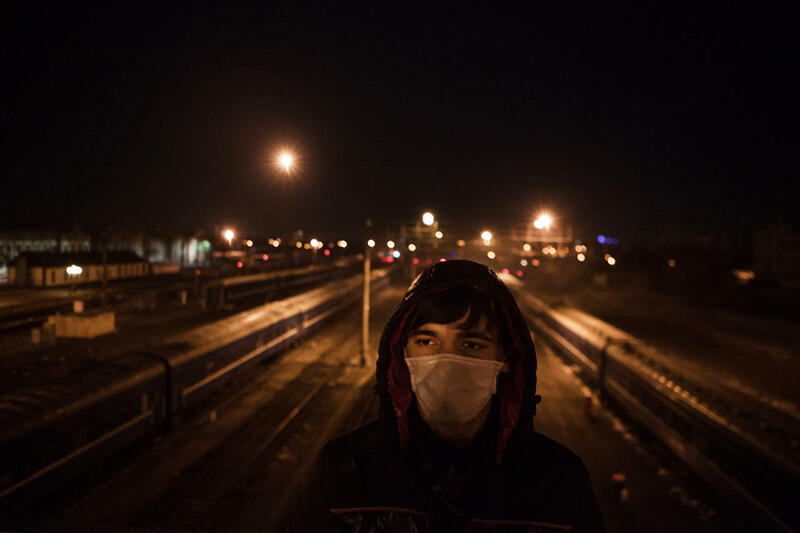 "In September 2016, 400-600 people traveled by train daily, because winter was coming and [they] needed to pass [into Belarus] quickly. Now, families generally sit in apartments, money is scarce, and [the number] of people travelling by train at a time [has fallen to] 200. [Overall], their number is not decreasing, because we are constantly [welcoming] new refugees," said the human rights activist on November 13. The previous night, seven Chechen families came into the city, each consisting of an average of five people. Panasiuk himself is based in Brest. His colleagues come to his aid from time to time. 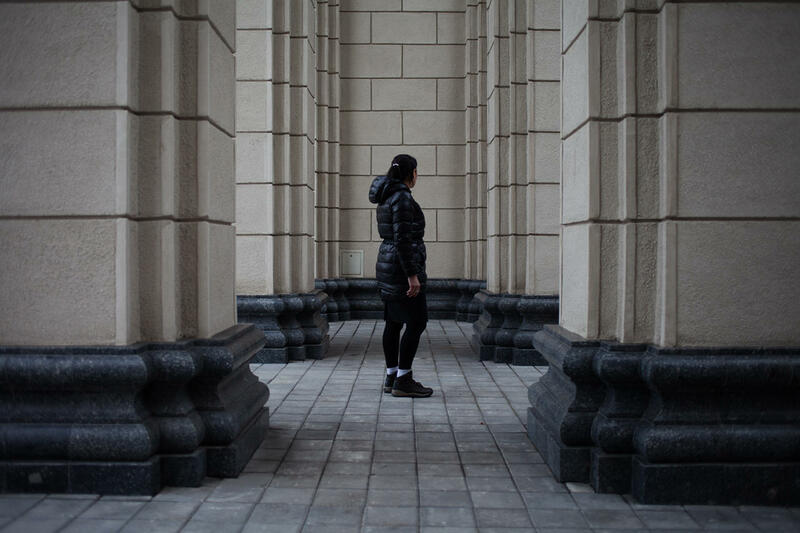 "The first time, I came for four days and surveyed people ... Kadyrov's people were sending [the refugees] descriptions of how they themselves had had them raped and threatening to publish them," said a mission coordinator. "My immune system suffered so much from this stress that I lay down for a week with a fever. When I left, I had an emotional block [of sorts], because it was impossible to endure all of this constantly. New people are simply stunned by what is going on here and why people flee." The human rights activist realized from conversations with the refugees that today it is not only Kadyrov's critics who are oppressed in Chechnya, but also men who fought on the side of the self-proclaimed [Chechen Republic of] Ichkeria in the first and second Chechen wars in the 1990s. Most of the refugees live in rented apartments in Brest. Panasyuk says that locals are profiting from the situation financially. "A lot of [the inhabitants of Brest] had renovated their apartments and rent out studios for 300 euros a month, though for that money you can rent an [entire] renovated apartment in the center of Minsk. Many rent only by the day, charging 20 euros a day, says Panasyuk. Many locals have left their jobs, [choosing] to drive Chechens, meet them, and help them load things. In a nutshell, Brest [now has a great standard of living]." 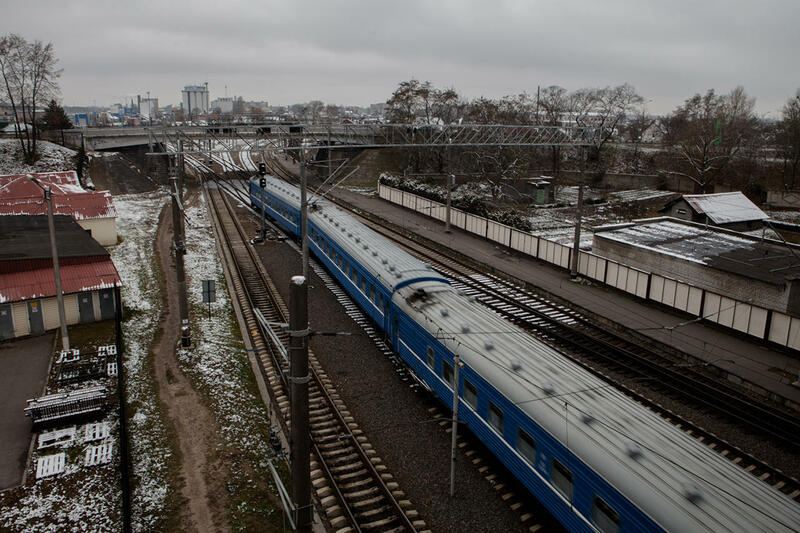 Belarussian Railways, too, earns no less than 80,000 euros a month thanks to people fleeing to the European Union. Despite the pressure of human rights organizations, Poland is not compromising on its position on refugees. According to Human Constantaestimates, 20 people were entering the country a day through mid-October; by November that number feel to no more than ten people (i.e. one or two families). Polish criteria are unclear, so each the opportunity to cross into the country legally is essentially a lottery. A ticket to Terespol and back costs nine euros. After a few dozen attempts and two months of rented apartments many Chechens run out of money. They live and sleep in the waiting room at the station. Chechens living in the West, according to Panasyuk, regularly send money to those who are stuck in Brest. There is a long viaduct along the paths lead from the station to the city center. Adjacent to it is an unassuming tavern called Status. The tavern has two halls: one offering cheap beer and standing room only and another offering a dance hall with paid entrance (costing three Belarussian rubles and about a hundred Russian rubles). Chechens come here in the evenings, many drink beer (Panasyuk, however, says that there are only ten such men out of hundreds of refugees) and some of them dance with girls. Sometimes, a drunken altercation arises with locals, who do not like that Chechens come to Brest in large numbers, just outside the tavern. Some refugees, according Panasyuk, find girlfriends here and spend their nights at their girlfriends' apartment until they couples quarrel. Belarus is not the most liberal country in the world, but authorities do not touch the Chechens. "They do not cause any problems, just sit there and sleep," said the head of the police station. "They themselves decide their fate. There is neither war nor [massive] problems in Chechnya at the moment. 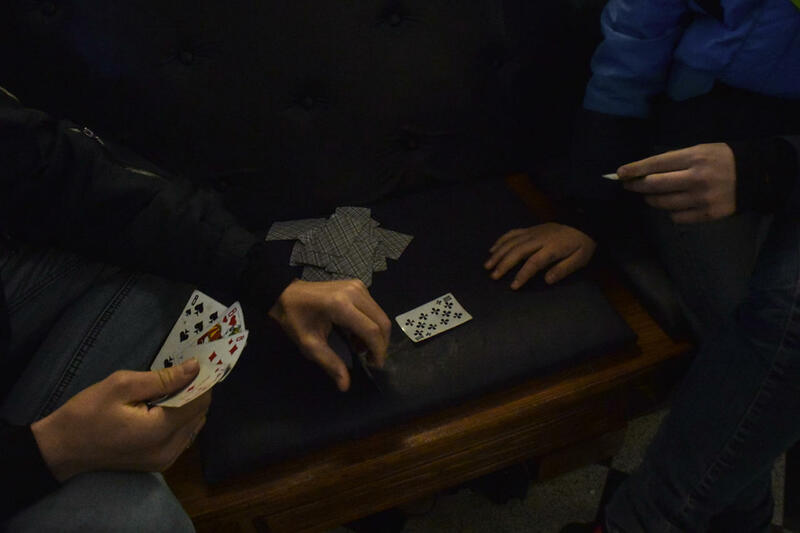 [Chechen] men go to casinos and bars, so they money though they sit here [looking] so poor and miserable ... I, on the other hand, work for 12 hours a day and cannot afford to go to bars. I pity the children. The women and children are here, while their husbands are renting apartments [or] hotels and sleeping normally. If you take a closer look at then, you will learn what their culture is. I [having been working] here 20 years. And all who have arrived during this time period [show the same patterns of behavior]." According Panasyuk, is would be disadvantageous for Belarus to oppress Chechens. "They are citizens of Russia. There will be a mess ... all human rights organizations will tune into this this and there will be a wild scandal ... Belarus does not want to raise this issue, because then it will be necessary to actually do something about it. Ukrainian refugees were quietly given work and homes in the villages. There were Chechens applying for asylum here with strong political histories. They were told to make a statement and promised residence permits and housing in return." The refugees path into Europe lies through Poland, but few wish to remain in the country itself. However, they have nowhere else to: Chechens with residence permits cannot cross the border into Ukraine and Arab countries give the Chechens back to Russia often. Both Panasyuk and the refugees are certain that there are Chechen authorities in Brest. "Once, I was speaking with a family and a man came up and showed them some slip of paper and said in broken Russian: 'You can stay here until October 9. If you do not pass [into Poland], when you get back, we will kill you' and left," said the human rights activist. Kadyrov's men are really here, they film us, provoke us, approach the families. If you identify a family, they can force their relatives in Chechnya to record videos denouncing them. There were such cases. After Kadyrov said that there were alcoholics and drug addicts here, several men came who got drunk here and wreaked havoc, but the police let them go, because they had slips of paper." All names of the Chechens in this article have been changed. People are reluctant to even talk to reporters anonymously about why they left Chechnya. Panasyuk managed to persuade only a few. He took a long time to persuade each interlocutor and brings them to the station one by one and they start talking. Nazira spent approximarely three months living at the station. By the time our article was published, she succeeded in making her way into Poland. This photograph was taken on November 13, 2016. My husband's nephews, then aged 18-20, were Wahhabis. In 2005, someone tipped-off [Kadyriv's men] and they were all killed. After that, my husband was tortured for a long time by the FSB. There were constant threats; they would drop in at night and take him and demanded that he reveal which groups his nephews had been were in. He used to hide [our nephew's weapons] in the basement, that is true. But they did not find them, and we had the chance to throw them out. He would go into [the forest] with them. I do not deny it. But I do not think he knew who was in charge. After a year and a half after the young men were killed, my husband's younger brother and his wife were killed, as well. Kadyrov's men blew up their cars. He was an Islamist too. Their mother is disabled now. They threw a bomb and blew up the house, but she remained alive. She had an operation abroad and now lives in Germany. Once my husband was taken away at four o'clock in the morning and we could not find him for three or four months. We informed the police, but were ignored. They said that he went into the forest and our application was not even accepted. [Kadyrov] began to have constant torment. I also picked up, asking where he had been when he left. I was not tortured, but frightened. I'm more afraid for the children. At night, when it was not, they repeatedly dropped into masks. As they opened the door? I have no idea. One time, when I pulled the mask alone, he hit me with his elbow. One night, her husband was thrown back into their backyard. His health had suffered. He had, after all, been tortured constantly. Needles had been stuck his fingernails. They believe that Wahhabis are not people. Honestly, it was impossible to live there. It must be seen [to be believed]. I was present in a situation where a young man was tortured. They wanted him to reveal which group [his brothers] had been a part of. Honestly I swear, they were torturing him. I cannot even say [how] ... This is forbidden for Muslims, as it is humiliating for men [to be tortured] ... (Panasyuk elaborates: "You mean sexual violence?" Nasir nods.) This all occurred before my eyes ... Most importantly, they recorded everything [on their cellular telephone]. They mask their faces and film. When he was released, this young man killed himself. He could not bear the shame. He was just nineteen years old. A train with the refugees returning from Terespol to Brest after being en turned away by Polish border guards. This photograph was taken on November 13, 2016. Then the anonymous phone calls began saying that I and my husband would endure the same fate. This problems persisted for three or four years. Then my husband died of a heart attack, and [the threats] somewhat subsided. They did come to see us several time though. His elder brother has gone away, his sisters have been living in Belgium for several years now, because they were not left in peace. I wore a hijab for nine years. The eldest of [my husband's] nephews went to study in Arab countries a long ago and returned a changed man. My husband, too, had changed. When you sit down and begin to communicate with them and listen to what they say, you somehow unconsciously already put on the hijab. But then I took it off. I left [Chechnya], because I was afraid, to be honest, mainly for the children. My daughter is already big and we have the Muslim custom that girls marry at 12-13 years of age. She looks older, and by age 12, our relatives were already finding her a husband. Scandals erupted. I wish for her to study and do not want her to marry even at age 20. Recently, I received a message from one of those who went [to Poland] two weeks ago. He started building a house on a property in Chechnya. They destroyed everything with a bulldozer upon learning that he had come here. There was a video of a family that did not succeed in making its way here and had to return home. There is a eleven-year-old boy who was told that he was a rooster. Kadyrov's men were jeering at him. The relatives of those discovered here have had their gas and electricity shut off. Kadyrov said that would not leave any one who has been to Belarus in peace. We pray five times a day, though there are those who pray three times a day. The [latter] are not considered humans, as the Wahhabis pray three times a day. If you work, you get half of the [promised] salary. [After the war], people were not compensated for destroyed houses. Two guards go with you to the bank, you take the money and then go to the local administration and give all the money away. People are silent because they are afraid. There is a young man who cannot have children, because he was tortured. He was a beautiful guy, aged just 30 at the time. He has a baby and a daughter, but cannot have any more children. I do not want to live [in Chechnya], though I am a Muslim. [My son] is ten years old. He will grow up in two years' time and not have a normal life there. Wherever you go, you carry your Islam in your heart. But I do not want to live in a way that puts my children in pain. We arrived three months ago and are now stuck at the station with money problems. We tried to cross eight times; after the sixth attempt I had a minor stroke and all of our money went to the hospital. It is good that our brothers abroad help us. If they did not, I do not know how we would lived. And without [Panasyuk] we could do nothing. 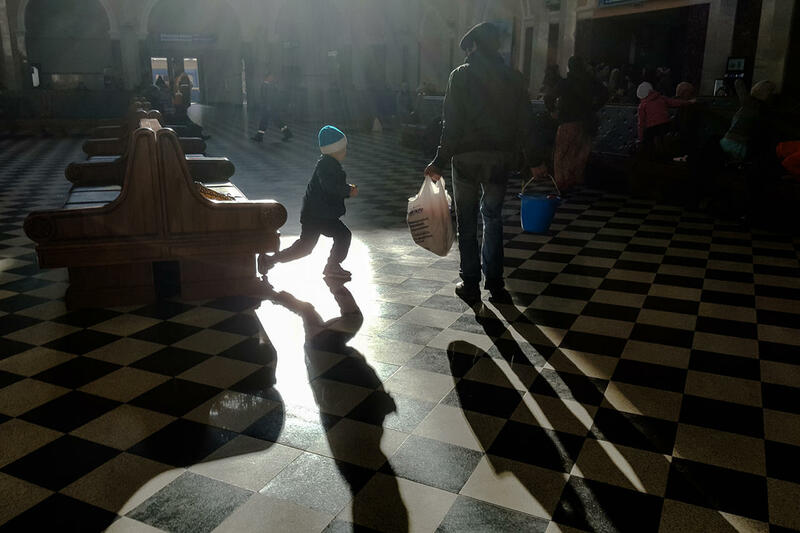 A boy from a family of refugees playing in the waiting hall at the Brest train station. This photograph was taken on November 14, 2016. Can I not tell you why I left? I was in danger ... I was summoned to serve in the army, but did not go to the police station. I was then taken in the night. They beat me, hit me with electricity, kept my head in a bag. I was kept for ten days. They told me to sign documents and work for them. They said that if I agreed to work for them and signed a contract, they would offer me a salary of 100,000 rubles a month, a house, a car, and a green light in everything. But if I became one of Kadyrov's men, I would have to hurt people. They said that if you are told to kill a man, you have to kill him. But if I did do something bad, then my children will become [victims of] vengeance, even if I die. [There would be a] vendetta. I know that some were sent to Ukraine and Syria as soon as they signed a contract. They were beaten and forced to sign contracts. Some people disappear. You are told that they went to Syria or to the mountains, and in two or three months they are found murdered with long beards. Recently in Grozny someone did something and they came to the mosque at five in the morning to collect all of the youths for questioning. The authorities need results and it makes more difference have they achieve said results. They could plant weapons or drugs. In Chechnya, you live normally if you have a relative in the administration. Then they do not touch you. And if you have no one to turn to, you do not live well. Once in Poland, no one wants to tell beautiful stories. One man abroad who spoke against Kadyrov has his family taken and beaten. After that, he apologized and said that Kadyrov was a good man. My family stayed at home, if I manage to move [to Europe], they will be tortured. If I do not have freedom of speech, then why the heck do I need my country. Here in Belarus, there is freedom of expression. You can speak your mind and if you are right, you win. After all, this is communism. Do not torment my family! If you cannot find me, they why torment my family? Because of one man, one thousand men are put on their foot. They are put into stadiums and forced to report on their [loved ones]. It is a shame that Chechnya does this to people. There is no law! Did he come up with this idea himself? Is he king of the earth? We have no more strength to fight Kadyrov. In Chechnya, 70% of people are not Kadyrov's men. Everyone is afraid, and we are afraid, but not for ourselves, but for our families. Those who were against Russia and Putin's war, have now surrendered and are now fighting for Kadyrov. There is no place to hide and no way out, you either die or spent your life living in the mountains and sitting. But you also need to eat! Kadyrov said that he would introduce a Stalinist regime in Chechnya. And he has! This is worse than the Stalinist regime. I have never complained about my people [and] have always fought for them. But do not torture my mother and my relatives because of me. Saeed is nineteen years old. 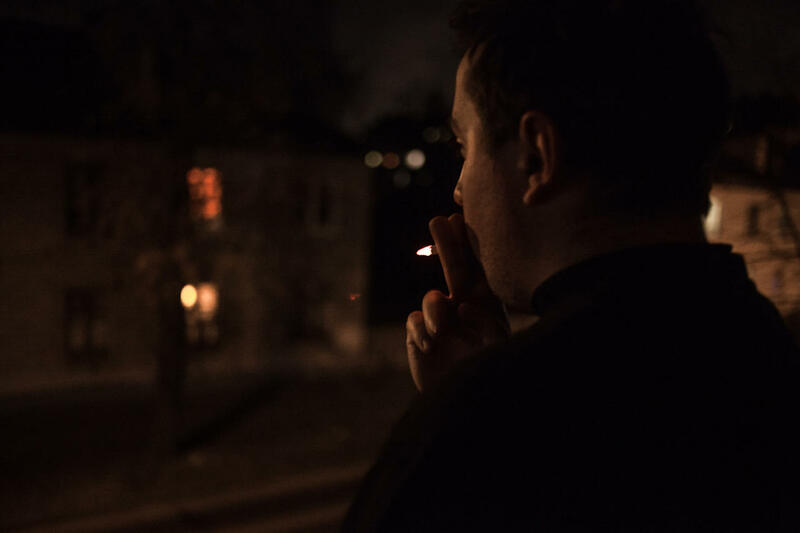 He smokes a lot, though he insists that he started smoking only after having left Chechnya. He wears a mask not because he wishes to hide his identity, but because he shaved his beard and is embarrassed about it. Brest, November 12, 2016. I arrived two months ago with my family. To be honest, it was because of my father. He tortures us, the entire family, my mother, my sisters. He smokes marijuana every night comes and ... well, you understand. He works for Kadyrov's men. 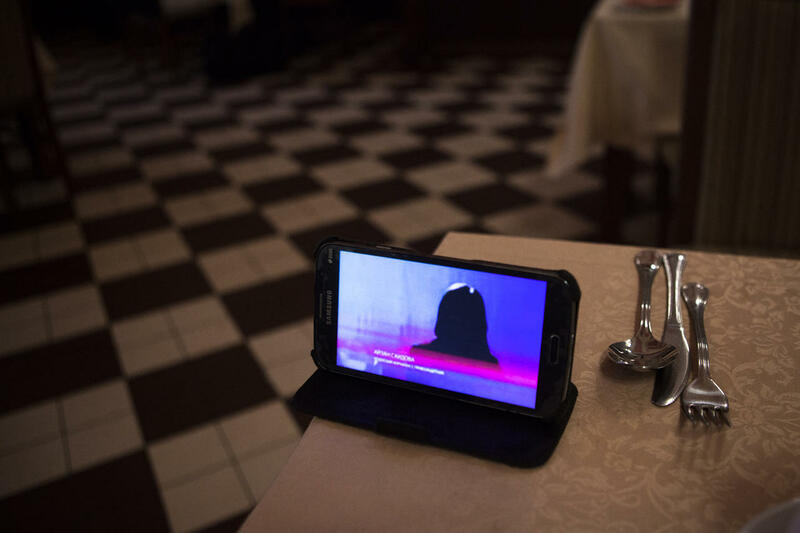 He is now in Chechnya, but sent us [a message] on WhatsApp and he would get us anywhere and kill [us]. There is nothing that I can do. It is forbidden [for Chechens] to turn against their mothers and fathers. If it were possible, I would have killed him long ago. It is painful that we are not being allowed into Poland. You can write that I am from Papua New Guinea, but anyone who reads this from my neighborhood will know that it is me. I would not even want my shadow to be photographed. I have not heard anyone here tell reporters why they left Chechnya. It is very risky. Our relatives [in Chechnya] can be beaten or raped. It would better if they were shot. There was young man who was tied to a chair. His wife and his sister were brought before him and raped in front of him. He died of a heart attack right then and there. [Kadyrov's men] are Chechens too. They know how to break our souls and use these methods. In Chechnya, bad things can happen as a result of a single word. I was lucky to be able to live there was so long. [Eventually], I spoke out against corruption. My boss told us that a commission was coming and that he was going to start collecting money for it. That is, I would have to give money to bribe the commission. [I] refused to pay ... and the attitude toward me changed immediately. They also collected money for football. I do not like football, but paid anyway. I did not go to matches ... no one even gave me a ticket ... the same [was done] for theater tickets. [They would] withhold [money] from your paycheck; [you] would not [get the] tickets. Money is constantly being held. We do not even know what our salaries are. I work two shifts and earn 5,000 rubles. How is this possible? [Other] people in my position earn higher salaries for working one shift. It should be at least 20,000 rubles. On television, our Kadyrov said that if someone withholds a single ruble from his salary, he would be imprisoned. I do not understand how he can lie so brazenly. It is impossible to fight or oppose [authorities in Chechnya]. Making a video or writing [a] newspaper article is even worse. You are done. If someone does not give way to Kadyrov's motorcade or bypasses someone from [Kadyrov's] entourage, he then disappears and is found dead. When beaten, people start to swearing and, as a result, are beaten to death. God forbid if you are suspected of Wahhabism. It was not even this bad under Stalin. If a son was arrested for speaking out against communism, the father was not touched. Here, nobody can do anything to [resist]. 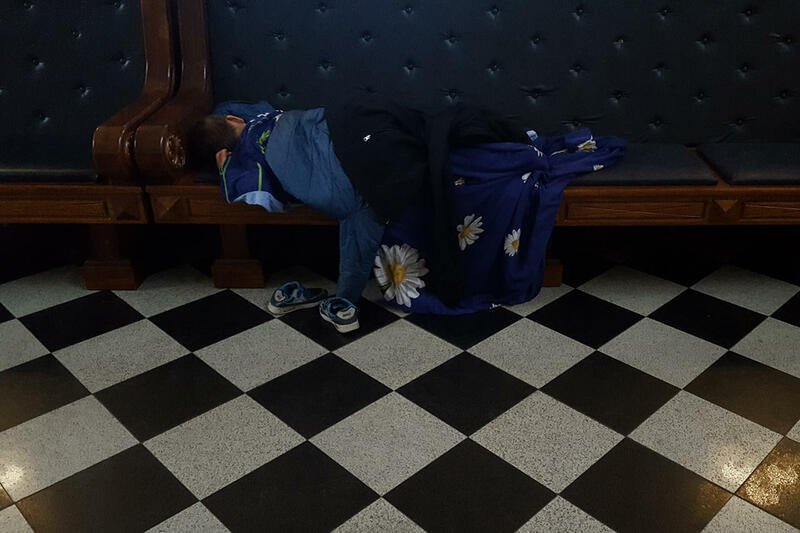 A child sleeping at train station in Brest. There are around 30 children permanently living at the station at present. Their ages range from six months to eighteen years of age. The station's administration forbids refugees from sleeping during the day. Brest, November 12, 2016. I do not like Kadyrov's policy ... They have their own direction [in our religion] - Sufism - and I [am a] Sunni. According to the Sunnah, girls wear headscarves and loose-fitting clothing. If girl walks down the street with a closed chin and loose-fitting clothing in the dark, they grab her and take her away to be beaten. I have heard so many such stories. They dictate [our way of dress], tell us that we need to wear tight clothing; wearing dark is impossible. The relatives of the young men who blew themselves up had their houses set fire to ... I understand that there are people who are hiding in the forest, but [Kadyrov's] confuses them with the people who just live by the Sunnah. Personally, I had family problems. My husband worked for Kadyrov's men and was also against the garment. They tried to take my child from me and stalked me, but I do not want to talk about it in detail. I am not a radical Muslim. I converted to Islam. As for the problems of women, I did not have them. It all depends on the kind of imam a woman's husband has. If a husband has an iman, then his wife is respected. My husband did not have an imam. I have not tried so many times to drive into Poland, but there is no money. [Border guards] are not listening and are just bullying me. It seems that they do not care. Монструозное сталинское здание железнодорожного вокзала в Бресте — мост из Союзного государства России и Белоруссии в Европу. Двадцать минут на электричке (чтобы сесть в нее, не нужно иметь в паспорте шенгенскую визу), и ты уже в польском Тересполе. Число беженцев, пытающихся попасть на Запад таким образом, резко выросло еще летом 2015 года. Прошлой осенью брестские пограничники сообщали, что если в январе 2015-го жители российского Кавказа и Средней Азии совершили 700 попыток переезда границы, то в июле — уже около двух тысяч, а в августе — более восьми тысяч. «Тогда все было просто. Приезжали, допустим, 100 чеченцев, и 70 человек из них пропускали в тот же день, а на следующий — оставшихся 30», — говорит Вячеслав Панасюк, координатор юридического направления Миссии помощи беженцам в городе Бресте, созданной правозащитной организацией Human Constanta. Все изменилось с приходом в Польше к власти консервативной партии «Право и справедливость» и наплывом в Европу сирийских беженцев. «По Польше прокатились митинги под лозунгами „Польша не мусульманская страна“, а многие поляки тогда говорили: „Идите вы с сирийцами, у нас и так уже много чеченцев“», — рассказывает Панасюк. Свою миссию Human Constanta развернула в Бресте в сентябре 2016 года, когда на чеченских беженцев обратили внимание российские и международные СМИ. Произошло это после протестного митинга, на котором чеченцы требовали от польских пограничников хотя бы принимать у них заявления на получение статуса беженцев (как того требует соответствующая Женевская конвенция) — потому что чаще всего те просто отправляли их обратно в Белоруссию. По словам Панасюка, сейчас в Бресте не меньше тысячи чеченских беженцев, и их поток не иссякает. «В сентябре 2016-го каждый день в поезде ездили 400–600 человек, потому что скоро зима и нужно побыстрее проехать. Сейчас семьи в основном сидят по квартирам, денег уже особенно нет, и в поездах ездят по 200 человек. Количество их не уменьшается, потому что мы постоянно отмечаем новых беженцев», — рассказывал мне правозащитник 13 ноября. Накануне в город приехали семь чеченских семей, в каждой из которых в среднем пять человек. Сам Панасюк находится в Бресте постоянно — его коллеги время от времени приезжают ему на помощь. «Первый раз я приехал на четыре дня, анкетировал людей, много записей видел — например, кадыровцы присылают людям записи, как они сами их насиловали, и угрожают опубликовать, — рассказывает координатор Миссии помощи. — У меня из-за стресса так слетел иммунитет, что я слег на неделю с температурой. Потом приехал уже с эмоциональным блоком, потому что невозможно через себя все это постоянно пропускать. Новые люди просто фигеют от того, что здесь происходит, и от того, почему люди бегут». Правозащитник уточняет, что из разговоров с беженцами понял, что в последнее время в Чечне «начали прессовать» не только ваххабитов или критиков Кадырова, но и мужчин, которые воевали на стороне самопровозглашенной Ичкерии в первой и второй войнах в 1990-х. Большинство беженцев живут в Бресте в съемных квартирах — Панасюк говорит, что местные жители уже сориентировались в ситуации и начали на ней зарабатывать. «Многие [жители Бреста] уже пересняли квартиры и сдают однушки по 300 евро в месяц, хотя на такие деньги можно снять квартиру с евроремонтом в центре Минска. Многие сдают только посуточно — по 20 евро в день, — рассказывает Панасюк. — Местные поувольнялись с работ, возят чеченцев на машине на попытку [проехать], встречают их, помогают вещи погрузить. В общем, Брест отлично живет теперь». Белорусская железная дорога тоже получает не меньше 80 тысяч евро в месяц благодаря попыткам людей сбежать в Евросоюз. Несмотря на давление правозащитных организаций, Польша свою позицию в отношении беженцев не смягчает. По подсчетам Human Constanta, до середины октября через границу пропускали примерно 20 человек в сутки; в ноябре — и вовсе не больше десяти человек (то есть одной-двух семей). Критерии поляков неясны, поэтому каждая поездка — лотерея. Билет в Тересполь и обратно стоит девять евро. После нескольких десятков попыток и двух месяцев аренды съемных квартир у многих чеченцев кончились деньги. Они живут и спят в зале ожидания на вокзале. Чеченцы, живущие на Западе, по словам Панасюка, регулярно присылают деньги тем, кто застрял в Бресте. От вокзала к центру города через пути ведет длинный виадук. С другой стороны к нему жмется непритязательный кабак «Статус». Здесь два зала: в одном — дешевое пиво и стоячие места, в другом — дискотека с платным входом (три белорусских рубля, около ста российских рублей). Сюда вечерами ходят чеченцы, многие пьют пиво (Панасюк, впрочем, говорит, что таких всего десять мужчин из сотен беженцев), некоторые танцуют с девушками; иногда около ресторана случаются пьяные стычки с местными, которым не нравится, что в Брест «понаехали чеченцы». Некоторые беженцы, по словам Панасюка, находят здесь подруг — и потом, пока не поссорятся, ночуют у них. Белоруссия — не самая либеральная страна в мире, но власти чеченцев не трогают. «Они особых проблем не создают, просто сидят тут и спят», — говорит начальник вокзала. Дежурящий на вокзале милиционер оказывается неожиданно разговорчивым. «Они сами решили свою судьбу — войны-то сейчас там нет, да и проблем. Мужчины-то их ходят по казино, по барам, так что деньги у них есть, хотя сидят тут такие бедные и несчастные, — излагает он свои представления о Чечне. — Я вот работаю по 12 часов, а позволить себе в барах бывать не могу. Детей жалко. Женщины и дети тут, а мужья снимают квартиры, гостиницы и спят нормально. Если на них посмотреть подольше, то вы узнали бы, какая у них культура. Я здесь 20 лет, и кто только не ехал за это время — одна и та же ситуация. Есть еще пешие переходы, но никто не хочет пешком». По словам Панасюка, Белоруссии притеснять чеченцев невыгодно. «Они граждане России, начнется неразбериха, врубятся все правозащитные организации, и будет дичайший скандал, — поясняет правозащитник. — Беларусь не хочет поднимать этот вопрос, потому что тогда с ним надо что-то делать. Украинских беженцев втихую устроили в деревни работать, дома им дали. Тут были чеченцы с сильными политическими историями, которые подали заявление на убежище. Им сказали: „Заберите заявление, мы вам вид на жительство сделаем, регистрацию, дадим жилье“». Путь беженцев в Европу лежит через Польшу, но оставаться там мало кто хочет. Однако ехать больше некуда: Украина, по словам правозащитника, людей с чеченской пропиской через границу не пропускает, а арабские страны выдают чеченцев обратно на раз-два. «В Белоруссии не так опасно, потому что кадыровцы не договорятся с федералами, чтобы они отправили сюда запрос, а сами кадыровцы не имеют полномочий отправить запрос», — говорит координатор Human Constanta. Он, впрочем, уверен — как и сами беженцы, — что в Бресте есть и агенты нынешних чеченских властей. «Я однажды разговаривал с семьей, подошел человек, показал какую-то корочку и на ломаном русском сказал семье: „Вам здесь можно до 9 октября находиться, не проедете, когда вернетесь, мы вас убьем“ — и ушел, — вспоминает правозащитник. — Кадыровцы тут реально есть, они снимают нас на камеру, иногда провоцируют, подходят к семьям. Если идентифицировали семью, то могут заставить родственников в Чечне записать видео, как те отказываются от них. Такие случаи были. После того как Кадыров сказал, что тут алкоголики и наркоманы (видимо, имеется в виду поств инстаграме Рамзана Кадырова — прим. „Медузы“), приехали несколько парней, которые здесь напивались, творили треш, а милиция их отпускала, потому что у них корочки». Все имена чеченцев в этом материале изменены, но даже анонимно разговаривать с журналистами о том, почему они уехали из Чечни, никто не хочет. Некоторых удается уговорить только Панасюку — правозащитник за три месяца в Бресте смог завоевать доверие беженцев. Он долго убеждает каждого собеседника, а потом приводит их по одному в вокзальный ресторан с высоким потолком, лепниной и помпезной люстрой, — и они начинают говорить. Племянники моего мужа, им тогда было по 18–20 лет, были ваххабистами (Назира называет ваххабитов именно так — прим. «Медузы»). В 2005 году кто-то дал наводку, и их всех поубивали, [накрыли] в доме. После этого мужа долго мучили в ФСБ. Были постоянные угрозы, ночью заскакивали, забирали. От него требовали сказать, в какой группе были его племянники, кто был у них главный. Он оружие [племянников] в подвале у нас хранил, это правда. Но они не нашли, мы его успели выкинуть. Он бывал там [в лесу], с ними ходил. Я не отрицаю это. Но не думаю, что он знал, кто главный. Через полтора года после того, как ребят убили, убили и младшего брата мужа с женой. Кадыровцы взорвали машину ихнюю. Он тоже был исламист. Мать этих племянников теперь инвалид. Они бросили бомбу, дом взорвали, но она живая осталась. Ей за границей операцию сделали, она сейчас живет в Германии. Один раз мужа ночью, в четыре часа, забрали, и месяца три-четыре мы его не могли вообще найти. Мы заявили в милицию, но на нас ноль внимания. Сказали, что в лес ушел, а заявление не приняли даже. [Кадыровцы] начали нас постоянно мучить. Меня забирали тоже, спрашивали, где он бывал, когда уходил. Меня не пытали, но пугали. Я больше боялась за детей. Ночью, когда его не было, они несколько раз заскакивали в масках. Как они только дверь открывают? Я без понятия. Один раз, когда я одному дернула маску, он локтем ударил меня. Однажды ночью мужа выкинули обратно во двор. Здоровье у него пострадало. Его же пытали постоянно. Током, иглами под ногти. Они же считают, что ваххабист не человек. Честно, там невозможно жить. Просто это надо видеть [чтобы поверить]. Я присутствовала в ситуации, когда пытали молодого парня, младшего племянника. Они хотели, чтобы тот сказал, в какой [его братья] группе участвовали. Честно клянусь, издевались вообще — я не могу это сказать даже [как]… Это то, что у мусульман вообще нельзя, это унижение для мужчин… (Панасюк уточняет: «Ты имеешь в виду сексуальное насилие?» Назира кивает.) Это при мне и моем муже было. Они забрали как бы на допрос, а сами в лес увезли. Это вообще страшно было, вот правда. И, главное, это все они снимают [на телефон]. Закрывают свои лица и снимают. Этот парень, когда его отпустили, сам себя убил. Не выдержал позора перед моим мужем, хотя у нас самоубийство самый большой грех. Парню 19 лет было. Потом начались анонимные звонки, что со мной такое же будет и с мужем. Три-четыре года была проблема. Потом муж умер от инфаркта, и [стало полегче] немного утихло. Пару раз, правда, заезжали. Старший брат уехал, сестры все уже несколько лет в Бельгии живут, потому что не давали покоя вообще. Я сама девять лет ходила в хиджабе. Старший из племянников еще давно поехал учиться в арабские страны и вернулся другим человеком. Мой муж тоже изменился. Когда садишься, начинаешь с ними общаться, слушаешь, что они говорят, то как-то машинально уже надеваешь хиджаб. Но потом сняла его, потому что невозможно было уже ходить, потому что постоянно за тобой следят и требуют: «Сними, сними, сними». Уехала [из Чечни], потому что боюсь. Честно сказать, в основном из-за детей. Дочка уже большая, а у нас же обычай мусульманский, что девушки выходят замуж в 12–13 лет. Конечно, сейчас уже не так, как раньше, но все равно это осталось. Она выглядит взрослее, и ее уже в 12 начали родственники со стороны мужа сватать. Скандалы у нас начались. Я хочу, чтобы она училась, я даже в 20 лет не хочу, чтобы она замуж вышла. Недавно прислал сообщение один из тех, кто прошел [в Польшу] две недели назад. Он у себя в Чечне на участке начинал строить дом, и бульдозером разрушили все, как узнали, что он сюда приехал. А еще было видео — семья не смогла проехать, вернулась домой, и там даже 11-летнего мальчика поставили и говорили ему, что петух. Над ребенком даже кадыровцы издевались. Или недавно 19 парней забрали, в том числе брата одной из тех, кто здесь ходит, и до сих пор ничего не известно. Родственникам тех, кто здесь находится и про кого узнали, газ и свет отключили, говорят. Кадыров же говорил, что не даст покоя всем, кто был в Белоруссии, кто хотел проехать. Они знают всё, кто чем дышит. Кадыровцы везде. Они и здесь есть. У нас пять раз в день молятся, а есть — кто три раза молится. Их считают нелюдьми, ведь три раза молятся самые сильные ваххабисты. Работаешь если, то половину зарплаты получаешь, хотя расписываешься за всю. [После войны] за разрушенный дом ничего [от компенсации] людям не досталось. Два охранника идут с тобой в банк, берешь деньги, потом идешь в белый дом и отдаешь все эти деньги. Люди молчат, потому что боятся. Тут есть парень, который не может детей иметь — так его пытали. Он был красивый парень, ему и тридцати лет нет, у него есть ребенок, но девочка, а больше детей иметь он не может. Жить я [в Чечне] не хочу, пускай я и мусульманка. Мальчику десять лет, через два года вырастет, нормальной жизни там нет. Куда бы ты ни поехал, свой ислам ты всегда носишь в своем сердце, а жить так, чтоб мои дети мучились, я не хочу. Мы приехали три месяца назад и вот застряли на вокзале, с деньгами проблемы. Проехать пробовала восемь раз, после шестой попытки у меня был микроинсульт, и все деньги ушли на больницу. Но хозяйка [квартиры] мне попалась хорошая. Дети жили это время у нее бесплатно, а сейчас она сказала, что на зиму, если не пройду, я могу прийти к ней. Хорошо, что наши братья за границей помогают. Если бы не они, то вообще не знаю, как бы мы жили. И без Славы [Панасюка] мы вообще никуда. Можно не рассказывать, почему я уехал? Мне угрожает опасность, вот и приехал сюда… Мне пришла повестка, но я не пошел в отделение. Тогда ночью меня забрали, били током, избивали, голову в пакете держали. Десять дней я там был, говорили, чтобы я подписал документы и работал на них. Потом выпустили, и мы уехали сюда. В первую и вторую войну я был ичкерийцем, потом меня амнистировали. Но потом — как что происходит [в Чечне], так меня избивают. Показывают фотографии и спрашивают, что это, где это, хотя я не знаю. Они хотели, чтобы я на них работал. Говорили, что если я соглашусь, подпишу контракт, то у меня будет 100 тысяч зарплата, дом, машина, везде зеленый свет. Но если я стану кадыровцем, то мне надо будет людей обижать. Они же говорят, что делать надо, и если говорят, что надо убить человека, то надо убивать. А ведь если я что-то плохое сделаю, то моим детям будут мстить, даже если я погибну. Кровная месть. Знаю, что некоторых отправляли на Украину и в Сирию, как только они подпишут контракт. Они по телевизору говорят, что у них добровольцы, стотысячная армия, но они избивают и насильно заставляют подписать контракт. Вообще кто им попадется, тех и забирают. Вот идешь ты — а вот тебя уже нету. Некоторые люди исчезают. Тебе говорят, что в Сирию уехал или в горы ушел, а через два-три месяца его находят убитым, с отросшей за это время бородой. Недавно в Грозном кто-то что-то сделал, они к мечети пришли в пять утра и всех молодых забрали и допросили. Им начальство говорит, что нужен результат, и им нет разницы [как его достичь]. Они могут оружие подбросить, наркотики. Лишь бы был результат. В Чечне живешь нормально, если у тебя родственник — начальник, министр, глава администрации района. Тогда тебя не трогают, а если все-таки забирают, то они тебе помогают. А если тебе не к кому обратиться, то ты плохо живешь. После перехода в Польшу я бы, может, красивую историю рассказал, а здесь никто не хочет ничего рассказывать. Хотя один за границей говорил против Кадырова, так его семью забрали и избивали. После этого он извинился и сказал, что Кадыров — хороший человек. У меня родственники дома остались, если я сбегу за границу, то их будут мучить. Если у меня нет свободы слова, на хрен мне нужна такая страна. Вот в Белоруссии свобода слова есть, тут можешь высказаться и, если прав, можешь победить. Здесь же коммунизм, так сказать. Не надо мучить моих родственников, мою семью. Если меня не нашли, то чего они мучают их? Извините за выражение, это ***** [неправильно]. Не надо мучить. Из-за одного человека тысячу человек поднимают, сажают на стадионе и отчитывают родственников. Это стыд для Чечни делать такое с людьми. Нет такого закона! Он себе что, свой закон придумал? Он что, царь на всей земле? А еще говорят, что в Чечне все нормально. С Кадыровым воевать уже нет силы. Никто не сможет сразу и с Россией, и с Кадыровым воевать! Мало уже нас осталось. В Чечне уже 70% кадыровцев. Все боятся, и мы боимся, но уже не за себя, а за семьи. Во время войны Россия не знала наши точки, ничего не знала про нас, а за Кадырова 70% чеченцев, и ему легко узнать все про оставшиеся 30%. Они сразу про всех узнают, что надо и что угодно. Кто против России и Путина воевали, они сдались и воюют теперь за Кадырова. Спрятаться места там нет. Нет выхода — или умереть, или всю жизнь в горах сидеть, а кушать же надо что-то. Кадыров говорил, что устроит в Чечне сталинский режим, — и устроил. Хуже сталинского режима. Я никогда на свой народ не жаловался, я всегда за него вступлюсь, но из-за меня не надо мучить мою мать, моих родственников. Я приехал с семьей два месяца назад. Если честно, то из-за отца. Он мучает нас — всю семью, мать, сестер. Он курит травку, каждую ночь приходит и… сам понимаешь. Он работает на кадыровцев. Сейчас он в Чечне, но по «Вотсаппу» прислал голосовое [сообщение] и сказал, что достанет нас в любом месте, убьет меня, мать. Я поделать ничего не могу. У нас против матери и отца нельзя идти. Если бы можно было, я бы давным-давно убил его. Если бы можно было как-то с ним управляться, мы бы остались, но такое невозможно забыть, тем более от близкого человека. А еще больнее, что нас не пускают в Польшу. Можете написать, что я папуас, но всем, кто из моего района прочитает, будет ясно, что это я. Я бы не хотел, чтобы даже тень мою фотографировали. Я не слышал, чтобы кто-то здесь рассказывал журналистам о том, почему люди уехали из Чечни. Это очень рискованно. Дома родственники остались, их могут избить, изнасиловать, это уже обычная практика, а для нас хуже этого ничего нет. Пусть лучше они всех перестреляют. Был случай — одного парня взяли, связали и посадили на стул, привели жену и сестру и на его глазах их изнасиловали. Он от разрыва сердца умер прямо там. [Кадыровцы] же тоже чеченцы и знают, что нам самое худшее, знают, как сломать всю душу, и используют эти методы. В Чечне с каждым может случиться [нехорошее] даже из-за одного слова, а я давно нарывался. Мне даже повезло, что столько времени я там прожил. Наверное, решили — пусть болтает, раз это из района не выходит. Я против коррупции выступал, потому что уму непостижимо, что там происходит. Жаловаться бесполезно, но терпеть уже невозможно было. Начальник на моей работе нам сказал, что едет комиссия, и начал собирать на нее деньги. То есть я должен сдавать деньги на взятку для комиссии. Первое, что я сделал, когда пошел против системы, — это отказался давать деньги. Если меня есть за что уволить, то пускай комиссия увольняет. Я свою работу делаю, чужого не беру. Отказался, и отношение ко мне сразу поменялось. Еще они собирают деньги на футбол. Матч же должен кто-то прийти смотреть, и билеты надо продать. Мне этот футбол не нужен, но я платил. На матч не ходил, конечно, я им не интересуюсь, но мне и билет никто не давал. Наверное, кто-то вместо меня шел, а может, никто не шел. Еще на билеты в театр удерживают из зарплаты, а сами билеты не дают. Деньги постоянно [на что-то] удерживают. Мы даже не знаем, какие у нас зарплаты. Нам показывают одну ведомость, которую мы подписываем. Вторую ведомость они сами вместо нас подписывают, которая идет в отчетность. Откуда я знаю? Знаю. Я работаю две смены, и у меня пять тысяч зарплата. Как это возможно? В других районах у людей на моей должности за одну смену зарплата выше. Должно было выходить минимум около 20 тысяч. По телевизору наш царек говорит, что если кто-то хоть один рубль удержит из зарплаты, он его посадит. Я не мог понять, как он может так нагло врать. Когда я подал жалобу наверх, они поняли, что я еще дальше могу пойти, и начали угрожать. Они поняли, что надо меня остановить, пока это не стало публично. Был известный случай с Рамазаном [Джалалдиновым]. Мне тоже в полиции говорили: «Ты что, хочешь закончить, как он?» Я знаю, как с ним все это произошло. У него кличка Фараон была. [В Чечне] были паводки, и у него дом снесло. У него было право на компенсацию, и он пошел в администрацию района. Ему отказали, потом пришли и сказали, что помощь будем пополам делить. Он отказался, хотя у нас все компенсации пополам делят. Вот и я отдал половину выделенных денег на молодую семью. Он не согласился, пошел на принцип, пожаловался в прокуратуру, почти дошел до Рамзана, в Совбез написал. Тут уже к нему пришли ночью домой люди в масках, схватили его и сказали, что расстреляют. Жена испугалась и ударила одного молотком по башке. Он взял на себя, и на него завели дело по нападению на сотрудника полиции, а то, что они ночью зашли, — это не считается как бы. Так его посадили. Когда он вышел через три года из тюрьмы, он поклялся, что не успокоится, пока не посадит всех, и сделал это видео, после чего сразу сбежал. Дальше вы знаете. С ним договорились, он извинился, ему дали миллион, потому что с ним уже работали правозащитники — и дагестанская прокуратура была за него. Но не факт, что он будет жить после извинений — я слышал, что он уже куда-то пропал. Бороться и выступать против [власти в Чечне] нельзя. Если сделать видеообращение или написать в газету, то это вообще все, такого где угодно найдут. Им нельзя допускать, чтобы все узнали, потому что тогда им надо самим себя посадить либо показать, что человек все опровергает и себя ненормальным называет. Я чисто по случайности не попался к ним, когда они ко мне ворвались в дом, потому что был не там. Жена позвонила, как [они] ушли. Я номер специально поменял, и когда они у нее требовали мой номер, она им показала в записной книжке под моим именем старый номер, а по новому уже потом мне позвонила. После этого я сразу же уехал из Чечни — у меня загранпаспорт был, потому что я ездил в Мекку. Если кто-то не уступил дорогу кортежу Кадырова или обогнал кого-то из его охраны, то он пропадает, и его находят потом мертвым. Просто когда начинают бить, то люди начинают говорить что-то в ответ матом, и в итоге их забивают до смерти. Не дай бог, если подозрение на ваххабизм есть. Такого даже в сталинские времена не было, чтобы отец за сына отвечал. Репрессии были, но если сына арестовали за то, что он был против коммунизма, то отца не трогали же. Никто не может ничего возразить вообще ни по какой теме. Три человека если поговорят, то они уже знают. Не знаю, как они узнают. Или кто-то из троих настучал, или у них везде жучки торчат. Шагу не сделать там. Недавно учителя из нефтяного института что-то обсуждали между собой в «Вотсаппе», и кто-то из них что-то раскритиковал. [Они] читают «Вотсапп», забрали восьмерых, отдубасили всех, и у одного ноги отказали. Всех, кроме него, отпустили, сказали, что он сбежал. У нас если говорят, что человек сбежал, — значит, он мертв, на 100%. В итоге его нашли под обрывом, но все его побои падением с обрыва невозможно объяснить. К тому же что ему делать под обрывом в отдаленном районе, если у него ноги отказали, как рассказали отпущенные коллеги? Митинги в поддержку Кадырова и Путина организуются так. Начальник говорит подчиненным, что каждый должен привести пять человек, а если не приведешь, то ищи другую работу. То есть каждый работник должен привести с собой людей. Даже когда люди вроде бы сами должны идти смотреть, например на волосы пророка, то все равно, чтобы показать, какие чеченцы хорошие мусульмане, туда людей насильно собирают. Все должны быть счастливы, кричать «Аллаху акбар» и «Слава Рамзану». Кадырова в Чечне поддерживает, может быть, 1% [населения], остальные боятся, но даже не его. Если вы со мной работаете и до смерти боитесь, то вы будете исполнять приказы, получать деньги, хорошо жить, но любить и уважать вы меня не будете. Даже его окружение его не поддерживает. Если бы российская власть ушла из республики, его с окружением за одну ночь вырезали бы. Пока за ним целая Россия стоит, ничего с ним не сделаешь. Вот он армию собирает, говорит, что это пехота Путина. На самом деле это только для его защиты. Он понимает, что в России может быть переворот или Россия развалится, а ему-то некуда бежать, его везде ждут чеченцы. Поэтому ему нужна армия, которая будет до конца биться и умирать вместе с ним. Если бы такая воевала против России, то война бы до сих пор шла, причем на территории России. В его элитных войсках сначала тренируют, а потом отправляют в лес, чтобы человек испачкал руки кровью. Чтобы когда Кадырова захотят прирезать кровники, эти люди не могли предать его и уйти, потому что они все вместе запачканы кровью. Кадыров не дурак, он о своей безопасности заботится, поэтому такое жестокое подавление любого слова против — все только ради своей безопасности. Он очень распутную жизнь ведет, он не такой праведный мусульманин, как показывают по телевизору. Был такой рассказ, как люди взбунтовались против короля, вошли во дворец, ножом пырнули короля и жену, и пока они еще не умерли, кто-то схватил их ребенка и разбил его о стену. Писатель пишет: «Какая же была вина этого ребенка». И сам отвечает: «Довели». Вот и нас уже довели. Людям нужен закон. Любой — хоть российский, хоть африканский, хоть шариатский. Только чтобы он работал и защищал права человека, чтобы можно было обратиться в суд и нас бы защитили. Этого у нас нет. Представьте себе, что вашего сына [забрали, а потом] выкинули на помойку. На нем видно все, что с ним делали, ни одной косточки нет целой. Ты видишь, как его раскаленным металлом жгли, как все пальцы расплющили молотком, все ногти вытащили, ногу не в одном месте сломали, чтобы пытку продолжать, как зубы наживую вырвали. Ты видишь, что сделали с твоим сыном, братья видят. Если бы я такое увидел, я бы всех их мучил, потом лечил и снова такое же делал. Не знаю, конечно, хватило бы у меня сердца на такое, но сейчас кажется, что смог бы сделать такое. И таких людей тысячи. Во время войны погибло людей в сто раз меньше, чем после войны. После войны в двухсот с чем-то селах каждый день мы слышим, что пропадают по одному, по два человека, и это продолжается лет десять. Я 13 раз пробовал в Польшу проехать, но там сидят люди, учившиеся европейской психологии. Они не знают наших особенностей, они смотрят пристально в глаза, а у нас мужчине непристойно смотреть женщине в глаза. А для них если не смотрят в глаза, значит — врут. Если в стране не защищаются права, то человек имеет право попросить защиты в другой стране. Прав [в Чечне] нет ни у кого. Если вы не смеете даже возразить и только из-за этого вы живой, то какие уж тут права. Поляки хотят, чтобы мы жили там как рабы? Почему мы должны жить как рабы? В Польше схватить кого-то труднее. Человека там надо схватить, а чеченцы обычно спортивные, и надо пять-шесть человек, чтобы увести аккуратно. Можно только взять киллера и пристрелить, как они уже делали. Здесь они еще могут на меня материал сделать, придумать, что я связан с террористами, что я пособник ИГИЛ, кого угодно из меня сделать, бумагу печатями заверить и отправить ее минским властям. Одного уже увезли отсюда, омоновцы [его] сняли прямо с поезда в Тересполе. Мне не нравится в кадыровской политике то, что они нашу религию на свой лад переделывают, делают нововведения. У них направление — суфизм, а я, например, суннитка. Девушки, которые одеваются по сунне, носят хиджаб и свободную одежду. Если девушка с закрытым подбородком в темной свободной одежде идет по улице, то ее схватывают, увозят и избивают и еще неизвестно что делают. Я слышала много таких историй. Сама не видела, но просто так бы не говорили. Они диктуют свою форму, говорят, что нужно обтягивающую одежду носить, темное носить нельзя. А нам так нельзя. Парней, у которых штаны подвернуты — по сунне тоже так надо, — забирают. Так нельзя ходить, потому что они считают, что сунна — это ваххабизм. У родственников парней, которые взорвались, поджигали дома, хотя они-то ни в чем не виноваты. Такая у них политика. Я понимаю, что есть люди, которые в лесу прячутся, но [кадыровцы] путают их с людьми, которые просто по сунне живут. Не то что путают даже, а зачем-то специально это делают. Лично у меня были семейные проблемы, муж на кадыровцев работал и тоже был против такой одежды. Ребенка пытался у меня забрать, преследовал меня, но я не хочу об этом подробно говорить. Я не коренная мусульманка, я ислам приняла. Что касается проблем у женщин, то у меня их не было, потому что для меня этот вопрос остро не стоит. Все зависит от того, какой у мужа иман [вера в Аллаха]. Если есть иман, то и права есть у жены, и уважение есть. У моего мужа, правда, не было вообще. Он там [на Кадырова] работал, поэтому исключено было о каких-то правах говорить. Я не очень много раз пробовала проехать, нет денег, да и вообще непонятно, есть ли толк пытаться. [Пограничники] не слушают и издеваются просто, не дают возможности рассказать, торопят. Такое ощущение, что им вообще без разницы. Мадина отказывается фотографироваться даже со спины, но не из-за опасений за оставшихся в Чечне родственников (она москвичка, вышедшая замуж за чеченца). «По исламу женщина себя напоказ выставлять не должна, а лишний раз на камеру сниматься — это очень плохо», — говорит она. Правозащитник Панасюк вступает в разговор и говорит, что тех, кого пропускают в Польшу, потом заставляют фотографироваться без хиджаба, причем делают это мужчины.